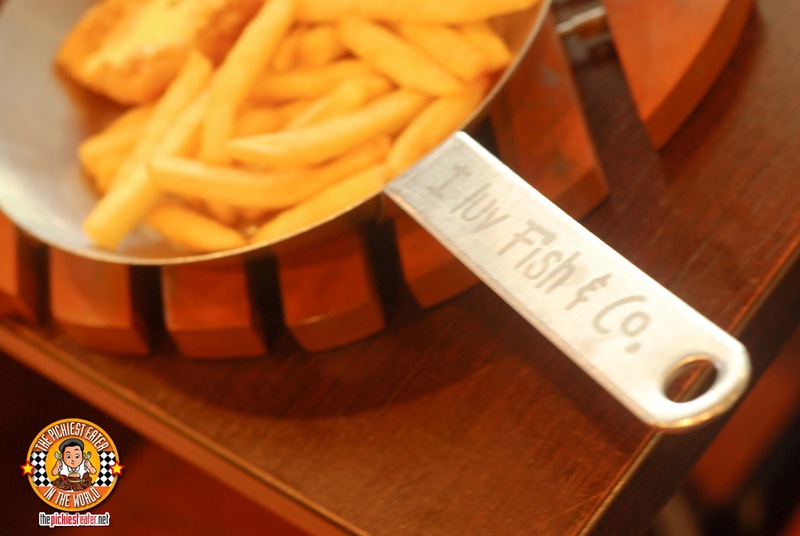 THE PICKIEST EATER IN THE WORLD: I LUV FISH & CO. ! Part of my being a "Picky Eater" is my aversion to seafood. With the sole exception of fish (which I actually love), I make it a point to stay away from creatures from the sea. There are a few incarnations of seafood dishes that I eat, but on the whole, it would be safe to say that i'm a carnivore, through and through. I don't eat Squid (except Calamares from some restaurants), nor do I eat shrimp or prawns (except for tempura and more recently, the blackened shrimp of Village Tavern, mainly because you could pour the sauce on a rubber slipper and I would still probably eat it). And to date, there are only two crab dishes that I would be willing to eat willingly.. The Crab Wonton from P.F. Changs (which doesn't taste like crab) and the Crab Cakes of Village Tavern. I don't eat clams, oysters, Mussels (yes, that includes baked tahong dripping with cheese), scallops and even lobsters. So as you can imagine, I'm no fun at Dampa and other seafood restaurants (I imagine it would be like taking a vegetarian to a place like Zark's Burgers or Brazil Brazil). But there is one Seafood Restaurant that I can never say no to, because they have one dish that is a member of the "One of the Best Things Ever" Club. 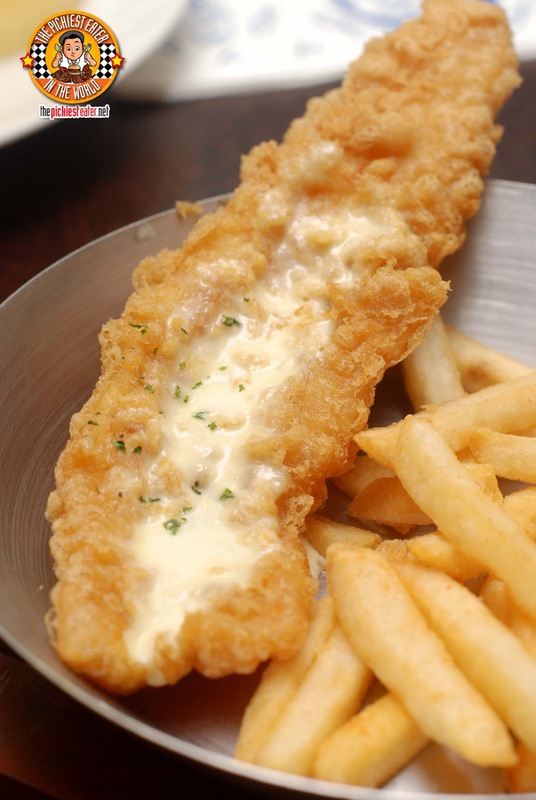 True to it's name, Fish and Co. really does have "The Best Fish and Chips In Town". As you can imagine, The interiors of Fish and Co. makes you feel like you're eating at a seafood shack down by a wharf or pier. The nautical inspired design boasts of different stuffed fishes, life savers, and virtually anything you can think of to help get your mind set on eating some serious amount of seafood. 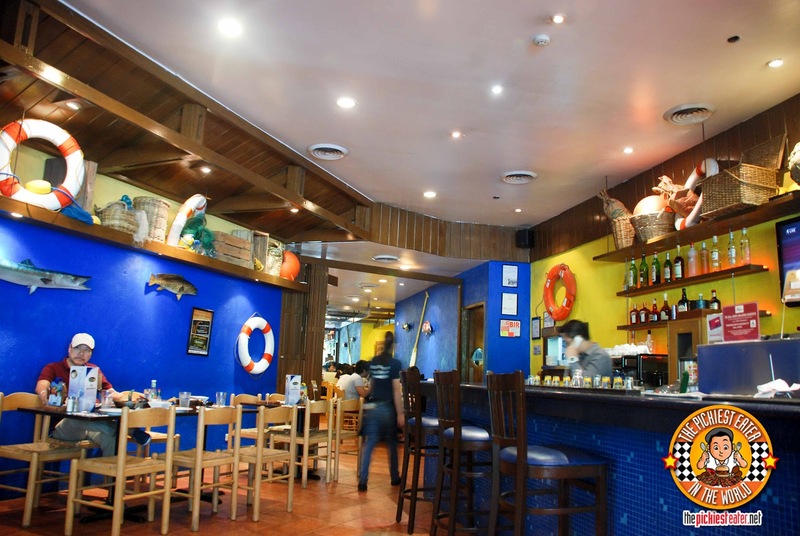 We were at the Greenbelt branch of Fish and Co., and in true Bistro Group fashion, the service was once again superb, with our attending waitress extremely courteous and attentive, and dishes were served in a reasonable amount of time. I'm not sure how many people would go to a seafood restaurant and think to order the Italian Sausage Pizza, however, in case you didn't notice, you're reading the true adventures of The Pickiest Eater In The World, so that's nothing that should surprise you (They DID have a seafood pizza, but I was planning on eating fish in this meal.. meaning my seafood quota for the day was going to be pretty much filled up). It took one bite for me to declare this one of my favorite pizzas ever. First off, Fish and Co. wasn't stingy with the Italian sausage, which was meaty and its flavor packed a punch, with its blend of fragrant spices fused into it. The cheese, wasn't as gooey as I would have wanted, but proved to be the perfect blanket to the tangy tomato sauce. 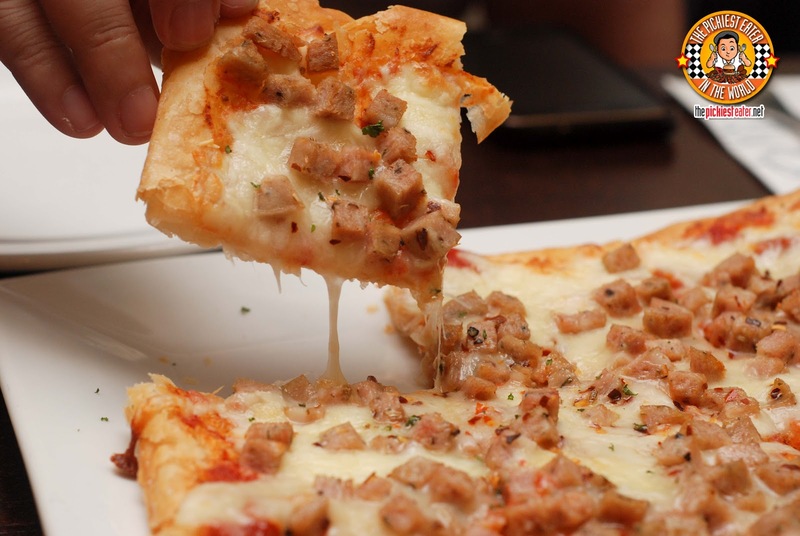 I noticed small specks of chili pepper, which give the pizza just the right amount of heat. But to me, what set this apart from the rest was the crust. If you're a strict lover of thin crust pizza, then this might not impress you. But if you're like me, and you love pizza in all its forms, whether thick or thin crust, then you're going to get a kick out of this. 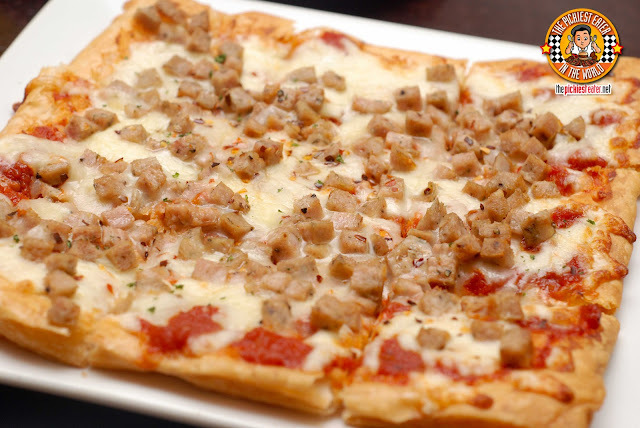 For the crust of their pizzas, Fish and Co. used something more along the lines of puff pastry, as they used Filo Dough. It was flakey, and the edges had a nice crispiness to it, but the inside of the dough was moist and lightly chewy. Still on a blackened shrimp high from our trip to Village Tavern, Rina asked if we could order something with Shrimp. Being the full fledged carnivore that I am, I was a little hesitant.. Until I saw the "Reef and Ranch" Specials they had. 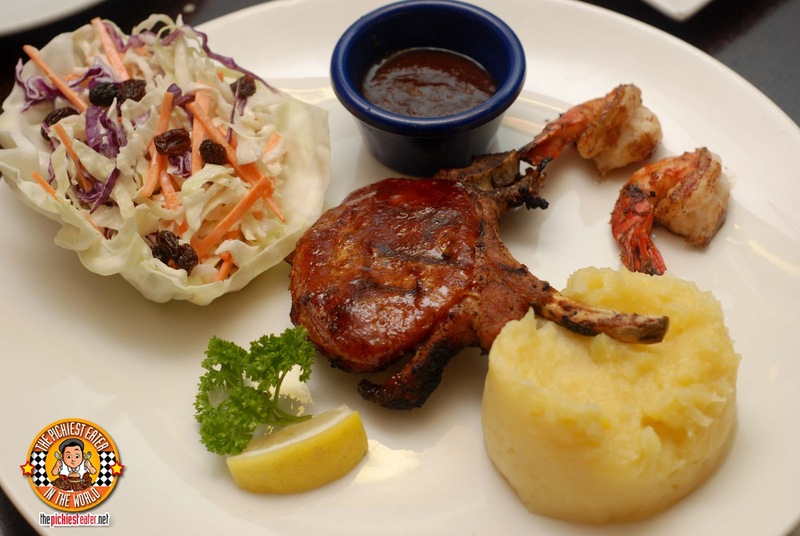 Among their "Reef and Ranch Specials", which is a collection of several "Surf N' Turf" dishes, was the "Ragin' Chops and Shrimp" plate, which came with a side of delicious coleslaw and creamy mashed potatoes. Naturally, Rina took possession of the Cajun shrimps as soon as the server placed the plate down in front of us.. Which was good because there were only two small pieces. She said they were seasoned just right, with a light touch of heat to it, and the BBQ sauce it came with complemented it very well (I think the sauce was actually for the pork chop though). By looking at it, you would assume that the Chop had been left on the grill a minute or so longer than I would have wanted. I was expecting it to be a tad bit dry on the inside as it looked on the outside, but to my pleansant surprise, the meat was still quite juicy. Not to mention that the burnt edge of the fat was quite yummy hehe. 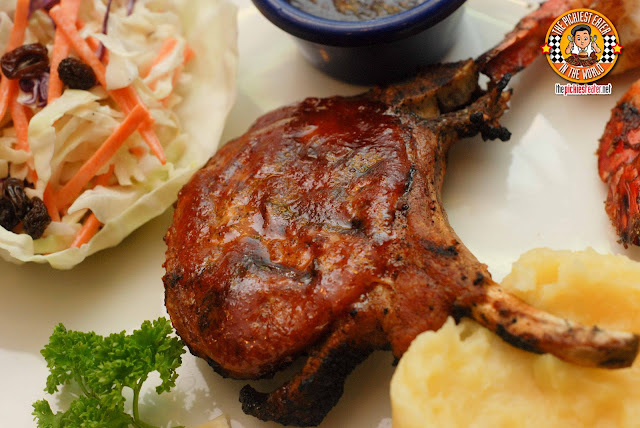 I would honestly have preferred a pork chop cut with more fat though (But that's just me hehe). There are moments in my life when I look back, sigh, and think to myself how I wish I could have done things differently. 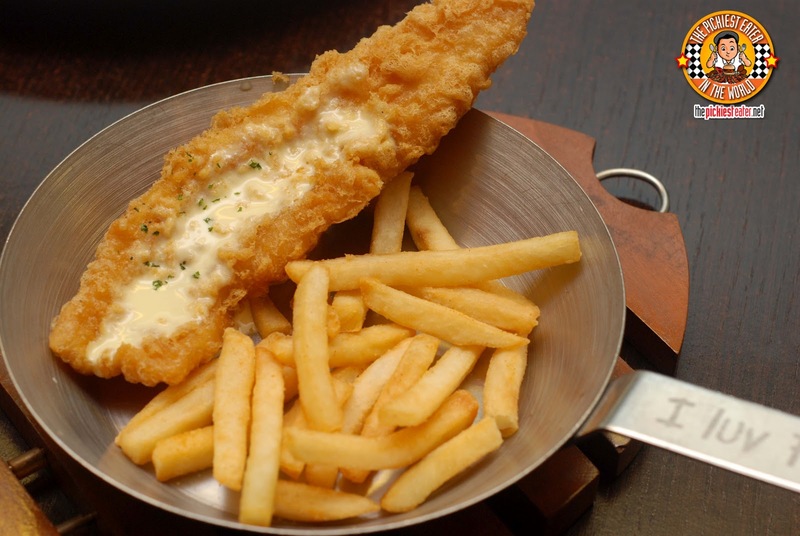 Ordering a smaller portion of Fish and Co.'s "Best Fish & Chips In Town" is one of them. What was I thinking? Well, the logic was, we planned on ordering a few more things to try, so it made sense financially and we didn't want Kevin Spacey knocking on our door accusing us of Gluttony. But after my first bite of this IN YEARS, I realized I made a huge mistake. I hadn't been to Fish and Co. in YEARS. But this is where I first bought my "BFF Card" that helped me get the attention of The Bistro Group. I bought the card SPECIFICALLY to use at Fish and Co., for their fish and chips. The other restaurants were honestly just a bonus. And I won't lie to you.. Over the past years I had been gone, I had a short fling with Chuck's Grubberie and a few other places. But Fish and Co.'s "Best Fish in Town" was the barometer that I measured every fish and chip dish I tried against. I honestly believed that Chuck's Grubberie came close to matching it. Then after taking my first bite of the fish in years, it set everything straight. To the point that I wondered how much jeopardy my relationship with Rina would be in if I decided to wolf down this bad boy all by myself. This isn't the best fish in chips in town. Trust me on this. THIS, my friends, is the The Best Fish & Chips in the WORLD. Yeah, I said it. Whether i'm right or wrong, it matters not to me, because I can't think of anything right now that could top this (Although I'd love to hear other contenders). The fish was deep fried perfectly in a golden coating that was crispy on the outside, yet keeping the fish a pristine white in the inside. Once you get through the crispy exterior and bite into the fish, the darn thing melts in your mouth. I know I've said that a lot about food, but i'm serious. The fish MELTS IN YOUR MOUTH. The lemon butter sauce that's poured on it gives it a wonderful creamy spin, and adds just the slightest hint of acid to balance everything out perfectly. If you haven't tried this yet, I strongly suggest you log off your computer right now and make haste to the nearest Fish and Co. Branch nearest you. Now that I'm armed with my new Bistro Circle Card, you can bet that i'm going to be visiting Fish and Co. a lot more often, and NEVER AGAIN will I settle for the "Single Portion" (I can't help but *face palm* every time I think about it)!! Oh, and In case you were wondering, Yes, I did share the dish evenly with Rina. I got the "Fish" and she got the "Chips". That's "even", right? Wanna try these dishes for free? Join The Pickiest Eater In The World's Giveaway #6! 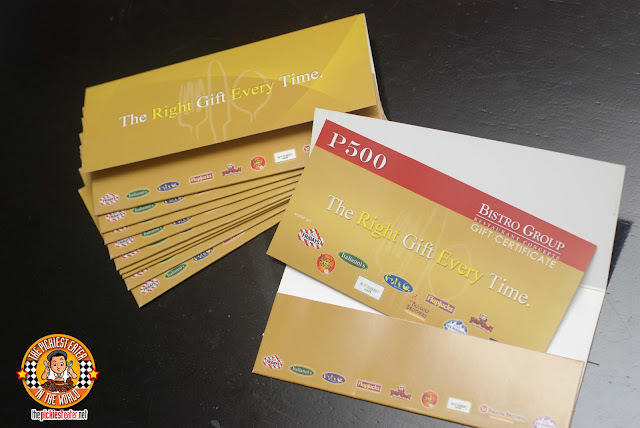 I'm giving away P3,000 worth of GC's from THE BISTRO GROUP!! uber love the fish & chips there! Best fish and chips, indeed! I Loved the New York but after a while I found it a bit nakakaumay.. Nevertheless its still better than most of the fish and chips out in the market today! Love the post Guia! Thank you for sharing! I love Fish & Co. They have the BEST, mouthwatering Fish and chips. ya know, maybe its just that i'm used to eating messy.. which is why I didn't realize how messy the pizza was! I Love Love Love fish and co.! I joined the summer workshop last year ( When i'm still 11 =( ) And we had free meals. And yes, Fish and chips, super delicious! That's amazing, Jelyza! I wish I had your drive at such a young age.. Good on ya!! I enjoyed the New York chips but the orig version i still my fave!! Becoming a food blogger has done that.. helped expand my horizons.. Thanks for the comment Grayhound!! I love their calamari too! Savory and crispy and not all flour! Haven't tried their calamari yet, but I'll definitely try it next!